Venezuelan President Hugo Chavez in August gave the world’s gold markets a double-fisted punch. On the one hand, he nationalized his country’s gold mining sector. On the other, he announced plans to bring all of Venezuela’s gold reserves back home to Caracas. Both moves unleashed a tidal wave of speculation over the socialist leader’s true intentions. Chavez says the nation’s central bank is studying technical and legal issues surrounding the unprecedented repatriation of gold reserves. Of the country’s $29.1 billion in international reserves, $11 billion is held in gold overseas. Another $7 billion in gold reserves are already held in Venezuela. The World Gold Council ranks Venezuela in 15th place among the world’s largest holders of gold reserves. Chavez says the plan will involve withdrawing as much as 99 tons of bullion from the Bank of England alone. Unless the government opts for a repo transaction that would not require moving the actual gold at all, the plan could otherwise pose interesting logistical and insurance challenges. While the strategy follows Chavez’s broader plan to shift around $6 billion in cash reserves away from US and European banks to those in countries considered friendlier to the president’s leftist regime, analysts speculate whether or not the move could be a mix of politics and economics. Some say the sector nationalization and reserve repatriation could boost the president’s standing ahead of next year’s elections, while others believe the president is concerned over the possibility of sanctions against his government that could lead to frozen Venezuelan assets abroad. The nationalization may help diversify the Venezuelan economy away from an overdependence on oil revenues, as the administration now plans to expand gold exploration projects. 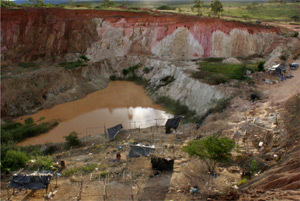 The country’s Guayana region alone is said to hold 140 million ounces of gold, worth about $250 billion. Mining companies will have to enter into joint ventures with PDVSA, the state-owned oil company now tasked with controlling the local gold industry. Mining companies are unlikely to flock to Venezuela any time soon, however, as the government still faces several billion dollars in lawsuits resulting from previous mining sector confiscations.